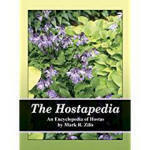 In 2009, Zilis published what is still the most extensive tome about hostas. It is 1,125 pages in length and contains descriptions of over 7,400 species and cultivars. In almost all cases, Mark has personally observed and taken notes on each hosta over the decades in many gardens in many countries. This highly detailed reference includes cultivar names, hybridizers and originators names, history, status of availability and descriptions of the individual plant's size, color, growth habit, etc. It also contains plenty of first hand observations and opinions by the author. This book is a must for the library of any serious hostaphile!